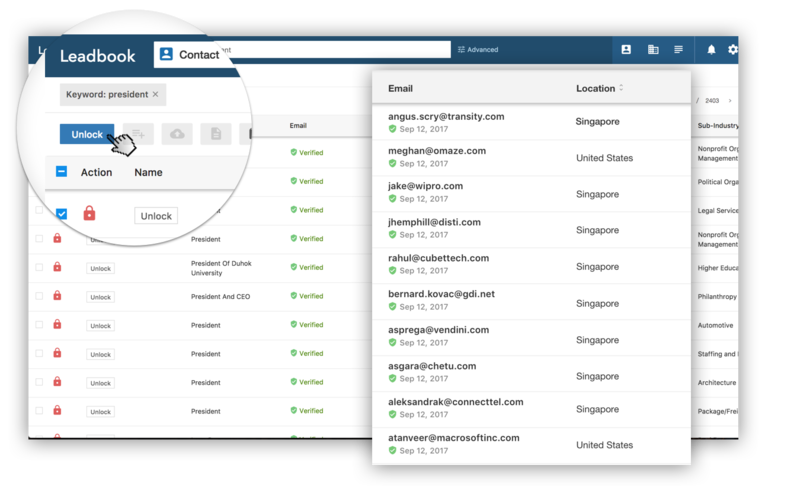 Leadbook helps sales teams discover new opportunities, build targeted lists in seconds and gain deep insights about their prospects and customers. 100% verified contact email ID. Guaranteed. Automatic notification when contacts become invalid. Singapore SMEs can now accelerate their go-to-market strategy easily through a global customer intelligence database offered by Enterprise Singapore and Leadbook. Discover new opportunities, build targeted lists in seconds and gain deep insights about their customers. Leadbook encapsulates the company’s vision to deliver seamless business data as an integral focus. Applicable to organisations with global headquarters anchored in Singapore, including SMEs. Returning customers cannot enjoy the 20% discount if their subscription is not renewed consecutively after the first subscription. Special offer has no limit to the number of users per organisation. Organisations can enjoy a customised 1-to-1 work session (30 min) with a Leadbook expert in business development to refine their go-to-market strategy.